It's IN! Needs some finishing touches, but it's in! Had to fanagle the coilovers a bit for the new brackets, but it all fit, with some persuasion and shims. 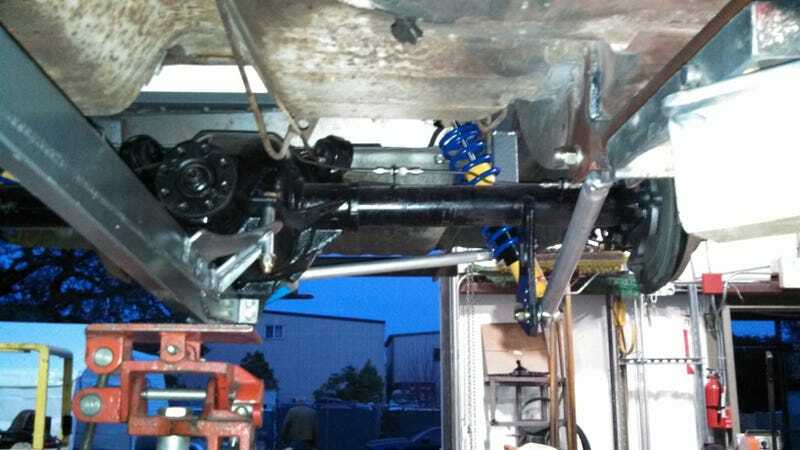 What's left is shortening the driveshaft, getting a new transmission mount (it's sagging and reducing clearance between the torque arm mounting bolt and the driveshaft), painting, and changing the axle shafts. Why am I changing the axle shafts? Look at how easy those pads are to change! I'm not so sure about the drilled/slotted rotors, but whatever.